Prominent & Leading Manufacturer from New Delhi, we offer bass drums, side drum, tenor drum, timpani drum, tubular bells and marching cymbal. A Bass drum is a large drum that produces a note of low definite or indefinite pitch. Bass drums are percussion instruments and vary in size and are used in several musical genres. Three major types of bass drums can be distinguished. 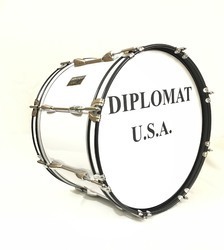 Bass drums are percussion instruments and vary in size and are used in several musical genres. A bass drum is typically cylindrical with the drum's diameter much greater than the drum's depth. There is normally a struck head at both ends of the cylinder. The heads may be made of calfskin or plastic. There is normally a means of adjusting the tension either by threaded taps or by strings. Bass drums are built in a variety of sizes, but size has little to do with the volume produced by the drum. The size is chosen is based on convenience and aesthetics. The snare drum or side drum is a percussion instrument that produces a sharp staccato sound when the head is struck with a drum stick. 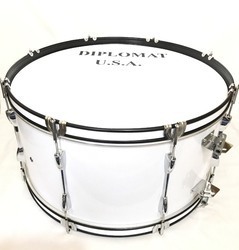 Snare drums are often used in orchestras, concert bands, marching bands, parades, drumlines, drum corps, and more. It is one of the central pieces in a drum set, a collection of percussion instruments designed to be played by a seated drummer, which is used in many genres of music. Snare drums are usually played with drum sticks, but the use of other beaters such as the brush or the route can be used to achieve a very different sound. The snare drum is a versatile and expressive percussion instrument due to its sensitivity and responsiveness to playing technique. 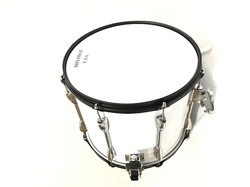 The sensitivity of the snare drum allows it to respond audibly to the softest strokes, facilitates the playing of complex rhythmic patterns and engaging solos at moderate amplitudes, and its high dynamic range allows the player to produce powerful accents with vigorous strokes and a thundering crack (120+ dB) with so-called rimshot strokes. The side drum is a well-known percussion instrument that is popular for a variety of uses. Some of these uses include orchestras, concert bands, marching bands, parades, drumlines, drum corps, and more.Each type presents a different dimension and style to this art. The snare drum that someone might see in a concert is typically used with a backbeat style to create rhythm. In marching bands, it can do the same technique but it is mostly used for a front beat. Early music tenor drums, or long drums, are cylindrical membranophone without snare used in Medieval, Renaissance and Baroque music. They consist in of a cylinder of wood, covered with skin heads on both ends, that is tensioned by ropes. Played with two sticks, this type of drum varies in pitch, according to its size. Tenor drums are used as a marching percussion instrument, Originally a rope-tensioned drum, giving way to modern rod tension, the tenor drum occupied a unique position in the drum corps of military and civilian pipe bands, being used as both timekeepers, accents to the musical ensemble, as well as spectacle. Tenor drummers use beaters on the end of long sticks, which are then tied to the fingers. The beaters are flourished in coordinated movements, while striking the drum; to add "spectacle". Modern pipe bands of average size usually field two to six flourishing tenor drummers. The basic timpani drum consists of a drumhead stretched across the opening of a bowl typically made of copper or, in less expensive models, fiberglass and sometimes aluminum. In the Sachs Hornbostel classification, the timpani are thus considered membranophones. The drumhead is affixed to a hoop (also called a flesh hoop), which in turn is held onto the bowl by a counterhoop, which is then held by means of a number of tuning screws called tension rods placed regularly around the circumference. The head's tension can be adjusted by loosening or tightening the rods. 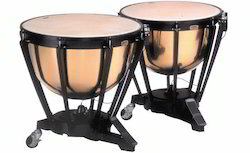 Most timpani has six to eight tension rods. The tubes used to provide a purer tone than solid cylindrical chimes, such as those on a mark tree. Chimes are often used in concert band pieces. Most composers write Chimes under the category of Percussion > Mallet Percussion. It rarely plays a melody, mostly a bass that brings out some color but sometimes has some solos or solids, often very simple. A Marching cymbal is a common percussion instrument. 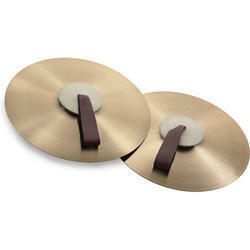 Often used in pairs, cymbals consist of thin, normally round plates of various alloys. The majority of cymbals are of indefinite pitch, although small disc-shaped cymbals based on ancient designs sound a definite note (see: crotales). Cymbals are used in many ensembles ranging from the orchestra, percussion ensembles, jazz bands, heavy metal bands, and marching groups. Drum kits usually incorporate at least a crash, ride or crash/ride, and a pair of hi-hat cymbals. A player of cymbals is known as a cymbalist. Cymbals are a common percussion instrument. Cymbals consist of thin, normally round plates of various alloys; see cymbal making for a discussion of their manufacture. The majority of cymbals are of indefinite pitch, although small disc-shaped cymbals based on ancient designs sound a definite note (see: crotales). Cymbals are used in many ensembles ranging from the orchestra, percussion ensembles, jazz bands, heavy metal bands, and marching groups. The anatomy of the cymbal plays a large part in the sound it creates. A hole is drilled in the center of the cymbal and it is used to either mount the cymbal on a stand or straps (for hand playing). The bell, dome, or cup is the raised section immediately surrounding the hole. The bell produces a higher "pinging" pitch than the rest of the cymbal. The bow is the rest of the surface surrounding the bell. The bow is sometimes described in two areas: the ride and crash area. The ride area is the thicker section closer to the bell while the crash area is the thinner tapering section near the edge. The edge or rim is the immediate circumference of the cymbal. The xylophone "sound, voice",meaning "wooden sound") is a musical instrument in the percussion family that consists of wooden bars struck by mallets. Each bar is an idiophone tuned to a pitch of a musical scale, whether pentatonic or heptatonic in the case of many African and Asian instruments, diatonic in many western children's instruments, or chromatic for orchestral use. 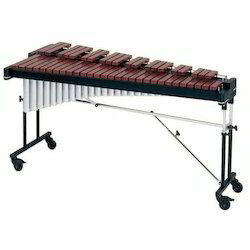 The term xylophone may be used generally, to include all such instruments, such as the marimba, balafon and even the semantron. However, in the orchestra, the term xylophone refers specifically to a chromatic instrument of somewhat higher pitch range and drier timbre than the marimba, and these two instruments should not be confused. 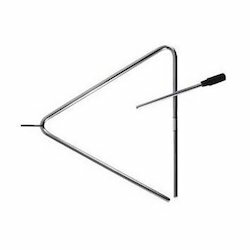 The term is also popularly used to refer to similar instruments of the lithophone and metallophone types. For example, the Pixiphoneand many similar toys described by the makers as xylophones have bars of metal rather than of wood, and so are in organologyregarded as glockenspiels rather than as xylophones. The bars of metal sound more high-pitched than the wooden ones.